A 21-year-old man is dead after a drive-by shooting in the Jane and Sheppard area, Toronto paramedics say. A 21-year-old man has died following a drive-by shooting in the Jane and Sheppard area, Toronto police say. 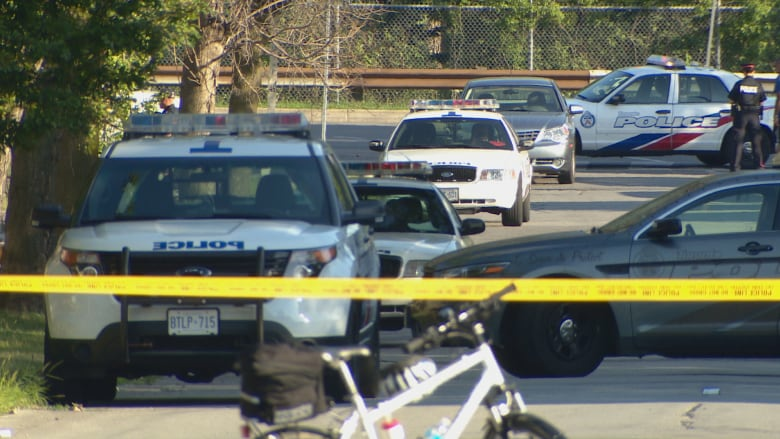 Police were called to the scene of Laura Road and Sheppard Avenue West just before 5 p.m. after reports of people in two cars shooting at each other while driving. Officers arrived to find a car with bullet holes with two men injured inside. One man was taken to hospital with life-threatening injuries. The second man suffered minor injuries, paramedics say. Police believe the two men were cousins. Const. Allyson Douglas-Cook told CBC News that anywhere from six to ten shots were fired in total. At the scene on Wednesday evening, Sgt. Rob Duthie told reporters shots came just one vehicle, a black Honda sedan that was seen fleeing eastbound on Sheppard Avenue West toward Jane Street. Few details are available on suspects. Police said two black males were in the car that fled. Laura Road is closed from Stanley Road to Sheppard Avenue West as police investigate.